The Folding Phone – both Samsung and Huawei showed a folding phone that when opened turned into a tablet. A neat trick that does demo well, but has questionable durability. How many folds will it take to kill the screen? How will it fare in a drop test? What does a folding case look like? How many lenses is enough? Another interesting trend was the increasing number of lenses on smartphone devices. I too have been frustrated with the lack of an optical zoom lens on my Samsung S7, when other situations needed a wider angle shot to capture all the action. And those snap-on external lenses are a optical disaster. So yes, I see a need for three lenses (wide, normal and zoom). But 5 lenses? My booth is bigger than your booth – It does seem that there is no limit to the size and scope of exhibition booth spend by some of the big manufacturers. Huawei’s main booth in Hall 1 has grown to take over half the hall, to an almost laughable size and scope of a full city block. What is the strategy here? Amaze and dazzle or push out any possible competitors? You don’t need a full city block of space to show off networking equipment. The cool stuff is in Hall 8 – if you must pick a hall to visit to really see the cool new gadgets and start-ups, head to Hall 8 at the very North end of the convention center. Because of its remote location, it’s less desirable to the big companies, leaving room for the startups and cool kids. Hall 8 featured Tesla showing off their new Series X car – an SUV with gull-wing rear doors. The new IoT innovations and drones can all be found in 8.0 (the lower floor of hall 8). 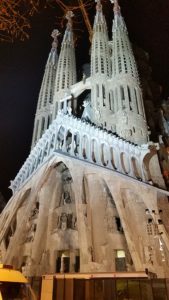 Step outside – I make an effort to tick off one or two gems of Barcelona while in town, working through the list of Gaudi architectural sites, or of historical importance. I was shocked when I found that others fail to plan at least one day or evening to go see the city. Don’t be that guy! A wireless conference with no wireless – It is clear that serving 107,000 people that are all carrying 2 or more mobile devices is an enormous challenge, but seriously, how does a conference on wireless technology not have ubiquitous and FREE wireless access? The L10 is the secret – hate the crowds on the L9 and the lines at the South Entrance? We discovered the new L10 Metro line and the new station across the street from the North Entrance. With an unusual choice of name, the “Foc” station gets some giggles when the automated announcements are heard overhead. The transit workers took aim at MWC – for the second time in the last 4 years, the transit workers of Barcelona flexed their labor muscles (figuratively) and called a partial strike, reducing the number of Metro subway trains by half and causing dangerous extreme over-crowding on the trains and platforms. With the majority of the visitors to MWC using the Metro systems, the workers were winning no fans from the visitors to their city. No ties required – While riding one of the many moving walkways, one of my coworkers pointed out the change of dress code at MWC. Four years ago, virtually all men at the show were in business suits and ties. This time, the collars were open and rarely a tie was in sight. I predict that next year, the untucked shirt and designer jeans of silicon valley will make their way to Barcelona. Did you attend MWC19? What did you see? Shoot me a message at alan.percy@telcobridges.com with your thoughts!